Make sure to check your microphone before joining a Skype for Business meeting or call and adjust volume levels and audio quality as needed. See Set up and test Skype for Business audio. 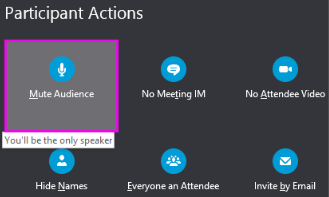 Sometimes when you join a Skype for Business meeting, your microphone is muted by default. The Mute button looks like when muted. When you want to speak, click the Mute button to unmute your microphone. The button changes to and you can speak. Note: You can also use the mute buttons on your laptop, keyboard or some USB headsets to mute or unmute your mic and speakers. Keep in mind that the meeting organizer sometimes mutes the audience. When this happens, you won't be able to unmute your mic. If you've called into a Skype for Business meeting by phone, you can use the mute or unmute buttons on your phone to manage your audio. Or you can use the touch-tone commands, such as *6, which lets you switch between mute and unmute. Press *1 on your phone to get a list and description of all available commands for your account. Note: When you call into a Skype for Business meeting by phone, your audio is on by default. Mute your mic if you're not speaking. If you're a presenter, you can mute or unmute meeting participants, individually or as a group, to eliminate background noise. To mute individuals, right-click the Mute button next to their name (conversation view) or above their picture (gallery view) in the meeting and click Mute this person. They'll receive a notification that they've been muted. You can right-click the mic button again to unmute their audio and they will be prompted to unmute on their side to open the line. To mute the entire audience, point to Participant Actions > Mute Audience. All meeting participants, including those on the phone, will be muted. To unmute, go back to Participant Actions and click Unmute Audience. If you’re having trouble with sound during a meeting, see Troubleshoot audio and video in Skype for Business.